Every Halloween, we have to make a decision on what kind of Halloween candy to get. 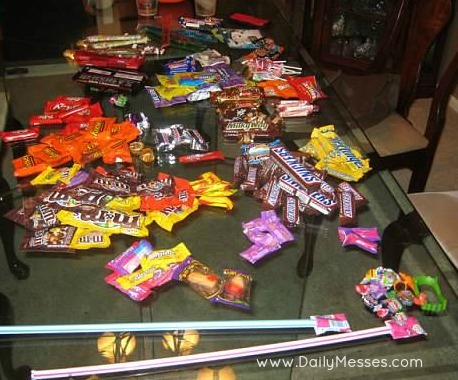 Once the trick or treating is over, we have to decide what candy to keep. The reject pile usually goes into hubby's work to find a home in the break/lunch room. 1. Glow in the dark necklaces. There is a neighbor that hands these out every year. Their beauty is two-fold: the kids love them, plus when it gets dark the kids are more visible. 4. Reeses's Peanut Butter Cups. The best, by far, are the pumpkin shaped ones. I think these (and the Christmas trees and Easter eggs) are the just right combo of peanut butter and chocolate. 5. Swedish Fish. My father-in-law passed on his love of this candy to my kids. It is a gummy candy, but the fish are soft and easy to eat. 6. Snickers. Peanuts, caramel, and chocolate. How can you go wrong? 7. M&M's. I love the snack size bags that come out at Halloween and Easter. I can throw them in the car or in the bag on the way out the door and the kids will each have their own little bag later for a snack. 8. Tootsie Rolls. I love these things and so do my kids. I like the mini rolls for the boys since they are easier to chew. 9. Pretzels. My kids love pretzels and actually like getting the the little bags at Halloween. It's not something coated in sugar or chocolate and I can throw them in my purse (or diaper bag back in the day) when we're going out for a few hours. 10. Coins. Growing up we had a neighbor that used to give out pennies and sometimes even nickles. 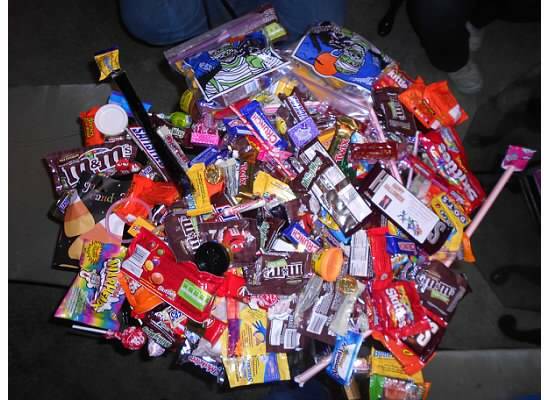 I think they probably just collected them through the year when they got change and then got rid of it all on Halloween. My kids are young enough that some pennies still excite them. 11. I'm adding on Smartees for myself. I know they are just sugar compacted into a little round disc, but I can take 1 roll of Smartees and slowly dish them out to the kids while we are standing in long line somewhere. I try to always keep one in my purse; it's amazing how well my kids respond to bribery. 1. Blow Pops. Sugar laden lollipop filled with a sugar laden gum, which my kids will only swallow. 2. Starbursts. I love these, especially the red and pink. However, Higgins stuffs the whole thing in his tiny little mouth and tries to swallow. It never goes well. Also a lot of unwrapping needed by little fingers. 3. Now & Later. We receive these every year, and every year they are stale and hard as a rock. 4. Plastic vampire teeth. My kids love these, but they just gross me out. The things are never in a plastic wrapped sealed container. No, they are just thrown into my kids bags. I have no idea who passes these out, if they wash their hands, etc. They get thrown out as soon as I see them. 5. Giant Pixy Stix. This is just evil to hand out to little kids. 7. Hard strawberry shaped candy. My kids never eat these. I send them into my husbands work in the reject candy pile. 8. Fun Dip. This may work for older kids, but my kids end up wearing most of it. 9. Jaw Breakers. Even the name sounds horrible. 10. Almond Joy and Mounds. Almond Joy's got nuts, Mounds don't...But they both have coconut. What kid likes coconut? 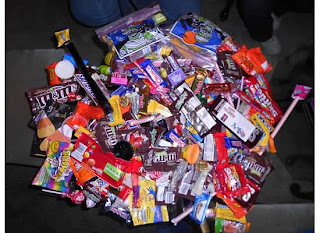 WHAT ARE YOUR LEAST FAVORITE CANDIES?